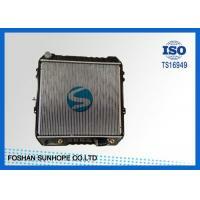 Home Companies FOSHAN SUNHOPE CO.,LTD. 1. Full set in box and 100% brand new. 2. 30% more cooling capacity than standard radiator. 3. The core of the radiator is welded in vacuum brazing furnace, no epoxy. 4. 100% quality assurance tested. We are a quality conscious company and ensure that the industrial and automotive radiators offered by us meets the international standards of quality, durability and performance. We are offering comprehensive range of Automotive / Truck / Generator Radiators which are in wide demand across the globe and they are manufactured using high grade raw material. All Replacement radiator include 1-year, unlimited-mileage warranty. 1. Payment By TT or Western Union is acceptable. 100% payment if the total amount is less than 3000 $. 30% deposit and 70% balance before shipment if the total amount is more than 5000$. 100% by western union if the total amount is less than 1000 $. Construction --- The most trusted and commonly used radiators these days are those that are made of aluminum because they're tougher and not prone to corrosion unlike other radiator options out there. Tubing ---The bigger and wider the tubes in the radiator, the better. The truth is, wide tubes maximize the contact that the coolant makes and because of that, more heat is absorbed from the engine. Aside from the width of the tubes, the thickness also determines how quickly the heat can be absorbed. Generally, the thickness of the walls should be minimized. Airflow --- For the radiator to function effectively, air should be able to flow freely through the core. That means radiators that have more fins are recommended by engine experts. However, too many fins could actually crowd and block the right airflow. A radiator with 15 fins is the best choice because it allows air to move freely for proper heat dissipation. Radiator Fans ---Believe it or not, mechanical radiator fans can eat up as much as 20 horsepower or 6500 RPM and that's the reason why you should switch to electric radiator fans. By using electric radiator fans, the movement of air inside the radiator would be improved and as a result, there's less chance that your car's engine would overheat. Coolant Restriction ---For your car to operate at optimum levels, it's important that coolant should never be restricted. You see, no matter how well built a radiator is, it's as good as useless if its coolant is actually being restricted. So before buying a brand-new radiator for your car, you better consider all things that were mentioned above that's because you don't want to spend anything on something that would simply disappoint you.